Are you ready for some retro tech? Celebrate the 10th anniversary of the Marvel Cinematic Universe! Tony Stark takes to the skies in his Iron Man Mark 1 armor! Features amazing sculptural detail and real metal elements. 14-inch scale statue is a limited edition of only 1,000 pieces. Get ready for some retro tech! To celebrate the 10th anniversary of the Marvel Cinematic Universe, travel back to where it all began with Tony Stark taking to the skies as Iron Man for the very first time! 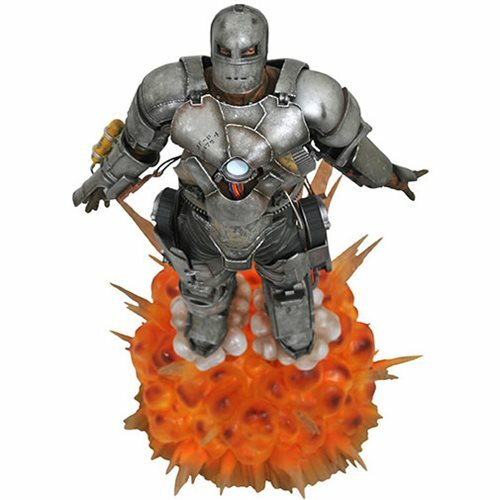 Wearing his scratch-built Mark 1 armor, Iron Man comes to life in this approximately 14-inch scale statue featuring amazing sculptural detail and real metal elements. Limited to an edition of only 1,000 pieces, this incredible Marvel Milestones Iron Man Movie MK 1 Resin Statue is the ultimate collectible for fans of Iron Man comics, movies, or of the Marvel Universe overall. It includes a numbered certificate of authenticity and comes in a full-color, hand-numbered box.